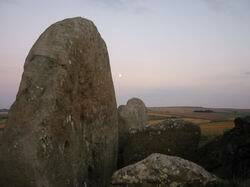 The moon provides a calendar for the folk of Stonewylde, a counterpoint to the eight festivals. 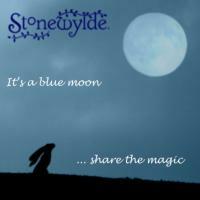 The Full Moon is celebrated in a special way, as this is the time when the women of Stonewylde are fertile and ripe. It’s known in close-knit communities for women’s monthly cycles to become synchronised, and such is the case at Stonewylde. The Dark Moon (some call it the new moon) fourteen nights or so later, is when the women of Stonewylde go into the Great Barn, again echoing some cultures where women are segregated during menstruation. In some places this is seen as a negative time, and women are forbidden to touch food or crops for fear of tainting them. But at Stonewylde it’s a time of sisterhood and bonding, where the women are relieved of many of their normal daily chores. They spend at least the first two days of their period together in the Barn, sitting around industriously involved in group projects such as quilt making, rush mat weaving and the embroidery of baby clothes. 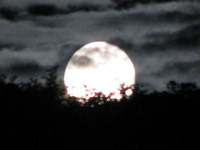 Moongazy is the word used to describe the effect of the Full Moon on people and animals. Many people are sensitive to the phases of the moon, and the word ‘lunatic’ stems from this. With the folklore surrounding werewolves and vampires, who isn’t aware of the Full Moon’s potential to affect our behaviour? Scientifically, we know about the gravity of the moon and its massive influence on the waters of our planet, creating powerful tides. As all living things, both plants and animals, are largely composed of water, it’s clear that the phases of the moon will affect everything – on a physiological level, at least. Hares are said to be creatures of the moon, and there are many documented cases of hares behaving very strangely during the time of the Full Moon. They race around wildly, but also spend long periods sitting with their ears laid back gazing up at the bright face of the moon. In Asian and Native American folklore, the shadows on the face of the moon are seen as the ‘hare in the moon’. If you look sideways, it’s possible to see this! The moon personified as a woman is common to many ancient cultures; Diana to the Romans, Artemis to the Greeks, and Hathor to the Egyptians. In pagan circles the moon is seen as a woman in her different stages of life. The waxing crescent New Moon is the Maiden, the beginning of a new phase and full of bright promise and young energy; the Full Moon is the Mother, ripe and fulfilled, a time of rich magic and nurture; the waning Dark Moon is the Crone, the ending and destruction of things, and sometimes a negative energy. This is the idea behind the concept of the Triple Goddess and the symbol of the three moons. This harnessing of the natural energy of the moon’s phases is echoed in many cultures’ customs of planting and harvesting according to the lunar calendar. Planting during the waxing, when the moon is growing and becoming more powerful, and harvesting during the moon’s waning, when the energy of the plant or tree is at lower ebb, is common amongst many people throughout the world, and throughout history. 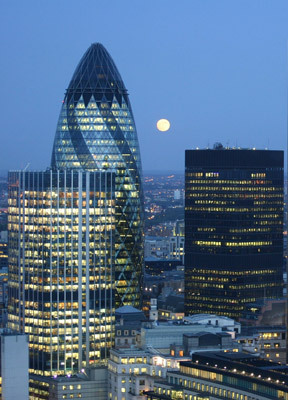 Ancient people who built wood and stone henges knew of the moon’s cycles, not only on a monthly basis but annually too. The Full Moon closest to the Winter Solstice rises in the same place that the sun appears at dawn of the Summer Solstice. Conversely the Full Moon at the Summer Solstice rises at the mid-winter sunrise spot. It’s widely assumed that sacred sites such as Stonehenge are aligned to the sun and the solar calendar, but there’s a strong belief too that perhaps it’s the moon’s rising that was mapped as well. Certainly the moon’s phases would have been the earliest calendar for our ancestors, and much easier to understand for the ordinary person than the more complex solar reckoning. The word ‘month’ derives from ‘moon’, of course. Many cultures name the different moons that appear throughout the year. Some of the names are derived from a time when farming was the most crucial activity, and everyone was involved with food production. Others are based on cultures further north where the winter months were very cold and desolate, and the months marked by the different periods of the freeze. 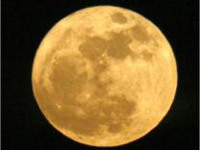 The moon?’s phases don?t coincide perfectly with the Julian calendar we use, with 30 or 31 days to each month. This is why every so often there are actually thirteen Full Moons in a year rather than the expected twelve. When there are two Full Moons in a month, the second one is always referred to as a ‘Blue Moon’; hence the expression ‘once in a blue moon’. 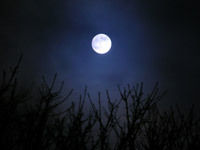 For those who believe such things, the energy is considered to be especially strong during a Blue Moon. When there are two Dark Moons in a month, the second one is called the ‘Black Moon’, and again magic is thought to be very powerful at this time. The Dark Moon is the time for banishing spells and bringing things to a close. The Full Moon is a time of creativity and fulfilment, and also healing. Whatever your personal beliefs and religion, the moon is a beautiful and constantly changing presence, both in our skies and in our psyches. When the moon is full and ‘walking the night in her silver shoon’, take time to tune in and harmonise with the special energy all around you. The Full Moon is the perfect time for reflection and meditation – even if you’re not moongazy.